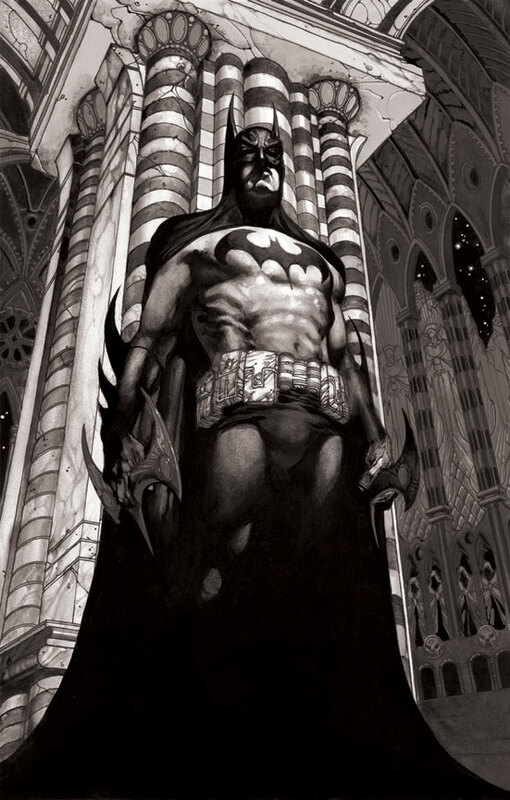 Batman: Face to Face Giclee on Canvas by Simone Bianchi is a limited edition artwork of Gotham's dark vigilante and detective: Batman. 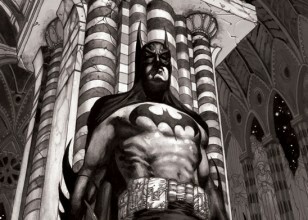 "Batman: Face to Face" illustrates the dark, yet detail-oriented style that has marked the Gothic style of DC Comics' artist Simone Bianchi. In this image of Batman, we readily observe the vigilante's tension as he readies himself to not just uncover the murderer's identity, but protect old foes as well. This image is taken from eight-part Batman Detective series, "Face to Face." A pivotal follow up to the "Infinite Crisis" series, where he must now solve a string of murders. Each piece is hand-numbered and hand-signed by Simone Bianchi. In mid-2004, Bianchi lived in New York City, and met artist Mike Bair, whose work Bianchi admired. Bair introduced Bianchi to DC Comics editor Peter Tomasi. After a few proposals, Tomasi gave Bianchi Grant Morrison's script for Seven Soldiers: Shining Knight, which became Bianchi’s first American work. ; it was published in 2005. The same year, Bianchi did his first American work for Marvel Comics, illustrating a number of covers for X-Men Unlimited. Bianchi’s illustrated the interiors of Green Lantern #6 (December 2005), and subsequently illustrated the covers for issue #8 (March 2006) to issue #13 (August 2006), which were written by Geoff Johns. Bianchi first ongoing monthly work for an American Marvel book was Wolverine #50 (March 2007) to issue #55 (September 2007), which was written by Jeph Loeb. To highlight the look of Bianchi’s ink wash work, each of these six issues was offered to readers in both a color and black-and-white version. Bianchi’s other Marvel work includes covers for Ultimate Origins, Astonishing X-Men and Thunderbolts. Bianchi also illustrated the covers of Batman, from issue #651 (May 2006) to issue #654 (August 2006). Bianchi signed a two-year exclusive contract with Marvel in February 2006, citing his childhood love of the superhero genre, and his greater familiarity with Marvel's characters. Though his contract precludes him from doing any European work, it allows him to continue the cover work he began previously for rival DC Comics’s Detective Comics, which ran from issues #817 (May 2006) to #839 (February 2008). Bianchi also hopes to continue his work on Ego Sum, the third book of which he has yet to begin, though he has not spoken with Marvel as to whether they would publish it in the United States Bianchi and writer Warren Ellis together worked on Astonishing X-Men, having taken over the book after the departures of Joss Whedon and John Cassaday. Following this he provided the art for the limited series Thor: For Asgard written by Robert Rodi.